In light of two Helping Hands Cambodia (HHC) students spending this week in hospital undergoing complicated eye operations, this blog addresses what we see as 3 essential criteria in reducing child and adult blindness in rural Cambodia. The students and their elder sister head to the hospital to operate on their glaucoma. Helping Hands student post-operation. 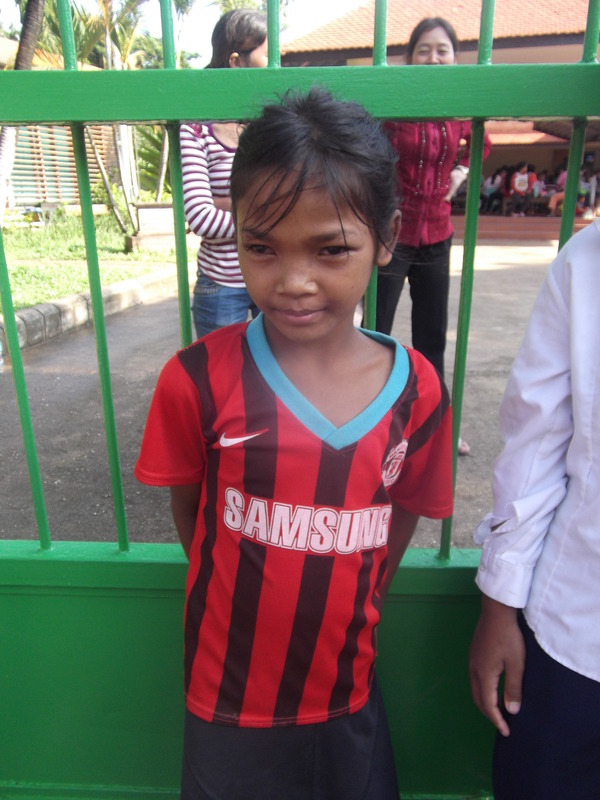 Her mother has joke-complained that “she won’t stop running around and playing!” now that her eyesight is much stronger. 1. To be aware of the warning signs of basic poor health. 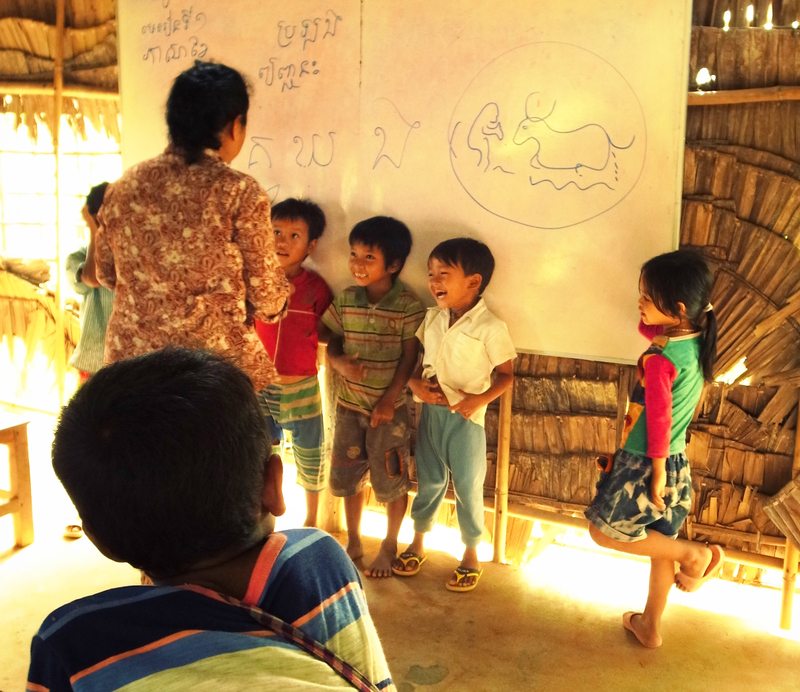 Both students who HHC supported to have their operations have poor attendance at Iqbal School, the education centre in the village, run by Helping Hands Cambodia. They are brother and sister, coming from a large family (11 members, 6 of whom are fully blind) who are peasant rice farmers and often need the children (aged 8 and 12) to help in the rice field. It is essential in rural Cambodia for all villagers to have access to check-ups from trained professionals; nothing can replace this medical knowledge. Traditional medicine is still the go-to in the village for nearly all complaints; whilst this may be effective for headaches and stomach aches, a serious condition such as infantile blindness needs specialist care and scientific knowledge. In the village where Helping Hands Cambodia is based there is no health clinic; the nearest basic clinic is 7km away down a difficult, muddy road, impossible for a blind family to traverse. The children’s eye-sight has worsened (irreversibly) as the family have not been able to access a hospital. The road from the student’s house to the basic health clinic, 7km further. 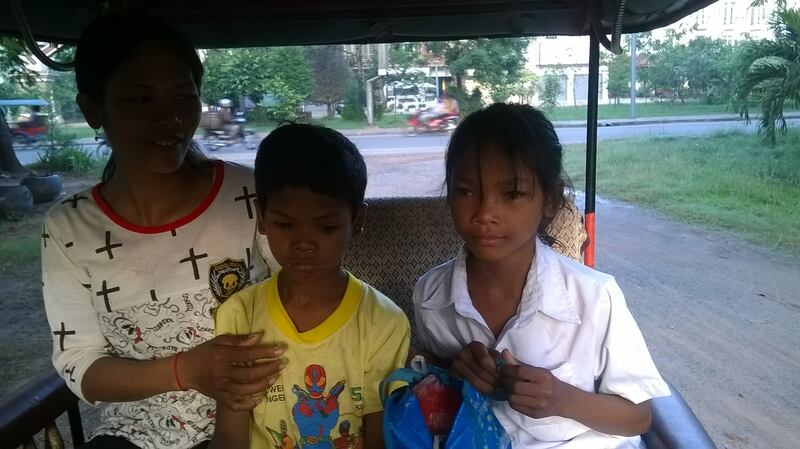 HHC supports our students (approximately 300) and their families with any medical emergencies by providing transport to Siem Reap town centre (25km away) where there are two free children’s hospitals. We also teach good health and hygiene at the school and provide basic first aid in order to set a strong example for our students. In addition, we currently sponsor one scholarship student to study a Nursing and Midwifery diploma so that in the future the village will have access to the medical support that they deserve. Helping Hands scholarship student studying Nursery and Midwifery (left) with his wife. Whilst the condition causing both children’s near-blindness is hereditary (glaucoma) the doctor explained after the operation that in both cases it had been seriously aggravated and advanced due to a poor diet. 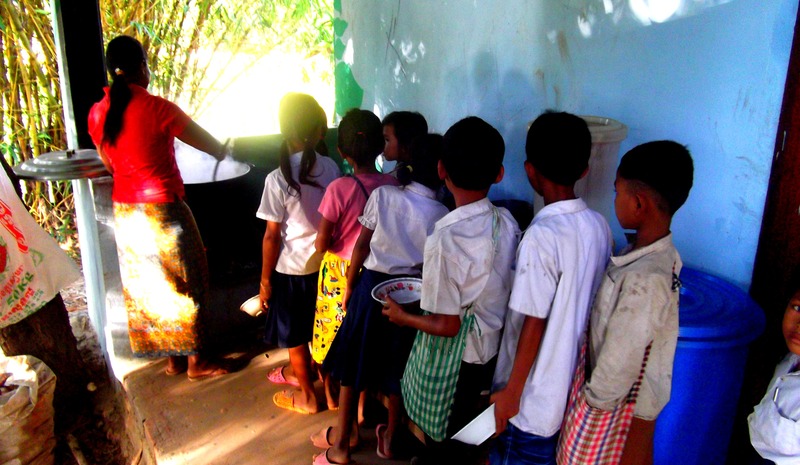 Village diets, particularly for the rural-poor in Cambodia, are heavily starch based (white rice) with minimal protein (small amounts of fish, pork, egg or chicken). Fruit and vegetables rich in vitamins and minerals rarely feature on the dinner plate. The doctor explained how Vitamin A will be essential to assisting these student’s recovery and is already heavily deficient in their diet. Vitamin A is an essential nutrient for vision, a healthy immune system and cell growth and is present in yellow, orange and green foods. Mangoes, papayas, jack-fruits, pumpkins, carrots and green-leafy veg are all great sources. The family members at the hospital simply pursed their lips, breathed in and shook their heads at the impossibility of buying the fruit which the doctors recommended, priced at $1 per kg. 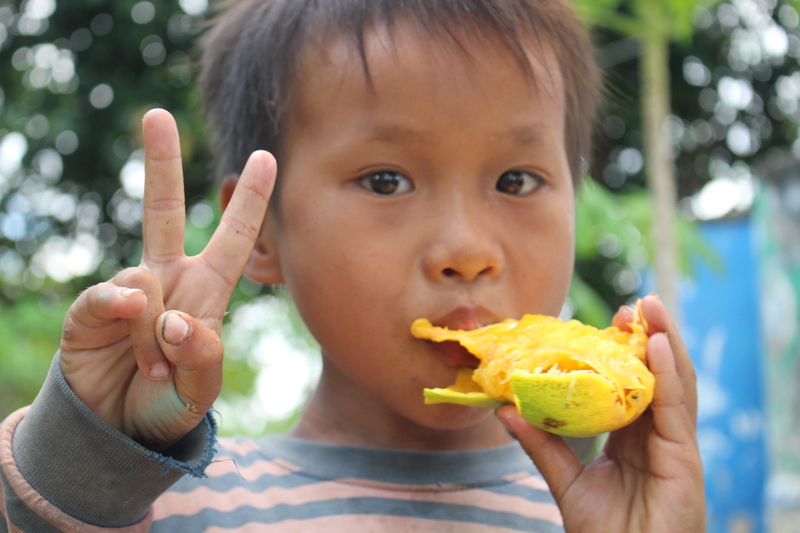 One of our students tucks into a vitamin-A rich mango from our trees on site. At Helping Hands Cambodia, we’re tackling this issue in two ways. Firstly, through education within the village. We run agriculture and nutrition training programs mainly attended by female home-makers. These courses demonstrate how to grow nutritious fruits and vegetables at a minimal cost and how to store and cook these products to preserve those all-essential nutrients. Secondly, we run a hugely-popular breakfast program which is attended by an average of 80-100 students on a daily basis at the school. Every day the menu features green leafy veg (the majority of which is grown in site). Every Friday is pumpkin soup day too! Breakfast club queue at Helping Hands Cambodia. Blindness and other serious health concerns in rural Cambodia are not going away despite recent economic developments in the larger towns and the wider region. The approach to addressing this and ensuring that the younger generation are in great health for their future is multi-fold. Helping Hands is aiming to support Prasat Chas residents with a broad education and access-based approach for their future.